Students (and all writers) frequently have problems with precision and concision. Naturally, during the writing process, students will produce woolly, imprecise sentences that only hint at the intended meaning and/or sentences that have only tangential relevance to their paper. This can be overcome by rigorous self-editing. However, attempting to objectively evaluate your own work is never easy. 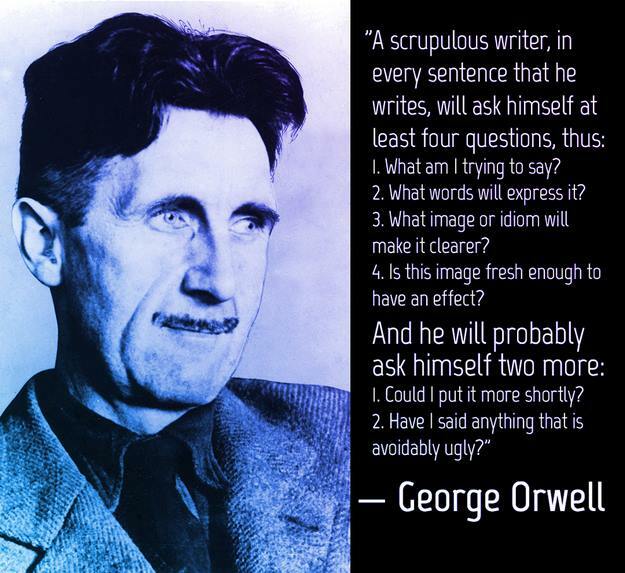 Fortunately, George Orwell provides some simple but effective questions to ask yourself each time you write or re-write a sentence. Moreover, while Orwell in this case refers to sentences, the same questions can be applied to paragraphs (Note: questions 3 & 4 concern journalism & storytelling not necessarily academic writing). I do appreciate your extra effort. It’s what makes the writing courses so popular.